29 West 38th Street stands 16 floors high in the heary of midtown. The building, also known as the Springs Building, was constructed in 1913. 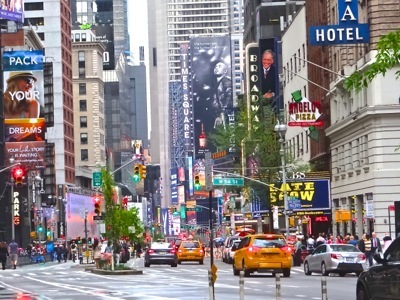 As the name would imply, Midtown sits in the heart of Manhattan. A Midtown location will give your company prime access to other businesses, restaurants, services, and clients. Restaurant options will feel virtually endless, but some of TheSquareFoots favorites include Uncle Jacks Steakhouse for an upscale dinner, Toloache for Mexican fare, and Pure Thai for incredible Pad Thai. Transportation will be a breeze with all major subway tracks running through Midtown. If you are looking for your company to be at the epicenter of it all, look no further than 29 West 38th Street . 0.42 mi🥘Bubba Gump Shrimp Co. 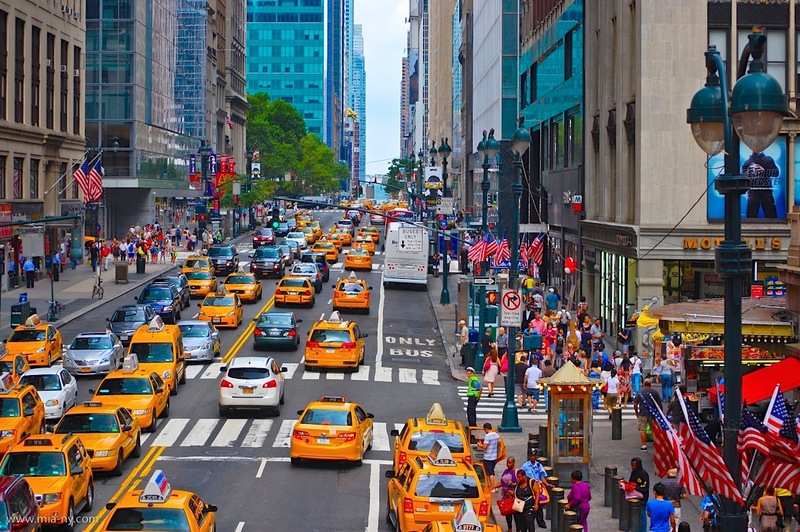 Midtown Manhattan is far more than a hub for tourism. It’s the largest central business district in the world, and home to thousands of businesses and some of the most iconic and diverse buildings in New York City. Midtown’s commercial real estate inventory includes more than 285 million square feet of office space for lease, two-thirds of which is in Class A buildings. With another 10 million square feet under construction, there’s plenty of office space in Midtown to choose from. 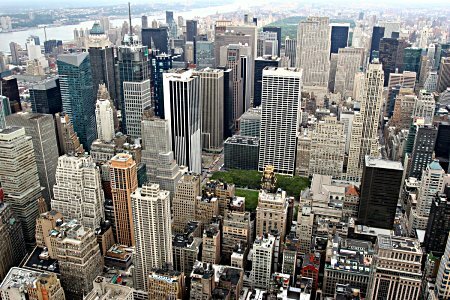 The average asking rent for Midtown office space (across all building classes) is $80 per square foot, slightly above the Manhattan office space average of $75 per square foot. This is driven by low vacancy rates and the vast amount of Class A office space (nearly 200 million square feet in total), which rents for $88 on average. Tenants seeking lower cost options can choose from Midtown’s 88 million square feet of Class B office space, which leases at an average of $62 per square foot. In addition to the 281 million square feet of office space in Midtown currently available, an additional 17 million is currently under construction. Within Midtown, there are areas where you can secure a lease that fits your company’s budget and timeline. 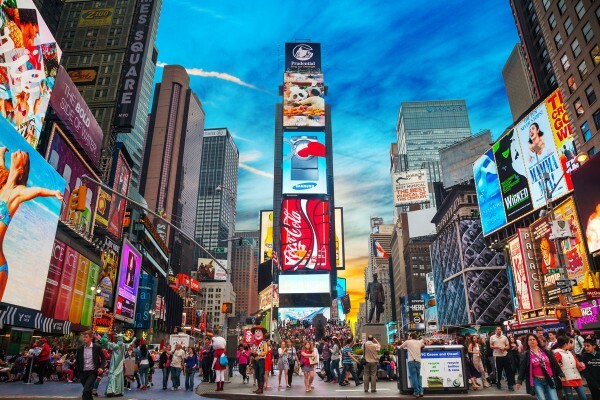 While Hudson Yards, Plaza District and Times Square command high prices, you can find great deals near Grand Central Station or in the Garment District. Available office space in Midtown Manhattan varies dramatically by size and style, so there’s plenty of appealing options no matter your business’ industry and plans for growth. Some of the largest recently signed Midtown leases include Ernst & Young for 600,000 square feet, Bank of America for 386,000 square feet, Ann Inc for 700,000 square feet, and Mizuho Americas for 270,000 square feet. Other Midtown-based businesses include Deloitte, Alphabet, McKinsey, Bloomberg, CNBC, Alliance Bernstein, Boston Consulting Group, Twitter, Sotheby’s, and Yext. The cost of office space depends on building type, lease type, office location, and planned construction. Not sure about the differences between Class A and Class B buildings? What about gross and triple net leases, and tenant improvement allowances? To better understand the complexities of the office space rental process, check out our Leasopedia and consider working with a licensed tenant broker. While highly walkable, Midtown also boasts impressive public transportation. Port Authority, Pennsylvania Station, and the Grand Central Terminal (one of the most visited tourist attractions in the world) shuttle in millions of suburban commuters, while millions more employees rely on the MTA trains and buses. For domestic and international travelers, Midtown Manhattan offices are centrally located between Newark airport and LaGuardia airport and within an hour of John F. Kennedy International Airport. The PATH train offers a car-free solution to get to Newark. It’s important to remember that centrally located doesn’t always make for a quick trip — be sure to budget your time accordingly. Stretching from Fifth Avenue to the East River, Midtown East includes the Plaza District, Park Avenue, Madison Avenue, and Grand Central Station. The neighborhood is popular among consulting firms, financial services firms, hedge funds, media companies, and organizations that interact with the United Nations or international consulates. Office space in Midtown East varies significantly, from more than $100 per square foot for Class A space to $60 per square foot in Class B buildings. One of the most luxurious and iconic blocks in the city, Park Avenue is home to Colgate-Palmolive, JP Morgan Securities, WPP Group, and many other global firms. Made famous by the advertising industry, Fifth-Madison is still a highly desirable location for companies of all sizes. Named after the iconic building, Flatiron is the heart of Silicon Valley, and NYC’s budding tech startup scene. Businesses in the Flatiron District enjoy the high ceilings, open floor plans, and affordable rents. Flatiron District extends from Madison Square Park to Union Square. Flatiron office space rents for an average of around $85 per square foot in Class A buildings, and closer to $65 per square foot in Class B buildings. The always-trendy neighborhood offers a mix of brick & beam structures, towers, and renovated warehouses. Alphabet (formerly Google) recently completed a $2.4 billion purchase of Chelsea Market to expand its presence in the area. With a vacancy rate of less than five percent, office space in Chelsea is hard to come by. If you find space to rent, expect to pay around $95 per square foot for Class A space, or $55 per square foot for office space in a Class B building. An ongoing mixed-used redevelopment project, Hudson Yards will feature high-rise luxury towers and Class A spaces that are already attracting high-profile law firms and financial services firms such as Blackrock, Point72, Cooley LLP, and Boies Schiller, and Milbank. Be prepared to pay a premium for office space — lease terms can reach $150-$200 per square foot. One of the most cost-friendly parts of Midtown, the Garment District offers more than 45 million square feet of office space and is home to many upcoming fashion, media, and technology companies. With Penn Station and Port Authority close by, commuting is easy for locals and suburban residents. However, proximity to the major transit hubs also brings plenty of noise and foot and pedestrian traffic. Garment District office space in Class A buildings rent for around $88 per square foot, while space in Class B buildings can be found for close to $60. In the 1920s, Midtown was reborn. Once a forgotten part of town, investors transformed the neighborhood into a business district, complete with the engineering feat of Grand Central Station. As Midtown gained renewed interest, the art deco Empire State Building opened with 102 floors dedicated by President Herbert Hoover in 1931. At the time, it was the world’s tallest skyscraper. In 1967, the Ostankino Tower in Moscow, Russia, took the title, and the World Trade Tower opened soon after with 104 floors. 42nd street became known as the “Valley of the Giants,” as the three largest skyscrapers in all of New York loomed overhead. And nearly 100 years after the first commercial real estate investments, Midtown is still buzzing with energy as the business capital of the world. While you won’t see as much greenery in Midtown, there are a few areas for reprieve from the city’s constant buzzing. Central Park has more than 800 acres of space to escape to, or you can head to Bryant Park. If you’re looking for some quiet time, take refuge in the 42nd Street Library.